Minnesota State College of Business panel judged the CEO of the largest business headquartered in Mankato as our 2015 Business Person of the Year. According to 54-year-old President/CEO Steve VanRoekel of Mankato-based, $568 million (2014 revenues) Ridley Inc., the business he leads doesn’t manufacture animal feed per se, but more the high-tech nutritional ingredients and supplements that go into making other animal feed better—similar to the way Intel chips make computers manufactured by others faster and better. VanRoekel and Ridley have at least one thing in common. Similar to the nutritional ingredients Ridley Inc. manufactures to help feed companies become better, VanRoekel has been and is a key ingredient in helping Ridley Inc.—and Greater Mankato—become so very much better. 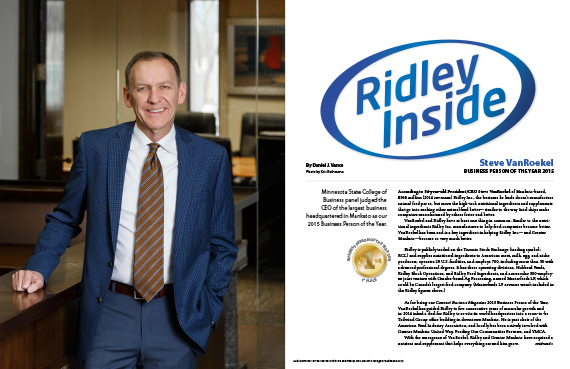 As for being our Connect Business Magazine 2015 Business Person of the Year, VanRoekel has guided Ridley to five consecutive years of muscular growth and in 2014 inked a deal for Ridley to re-site its world headquarters into a soon-to-be Tailwind Group office building in downtown Mankato. He is past chair of the American Feed Industry Association, and locally has been actively involved with Greater Mankato United Way, Feeding Our Communities Partners, and YMCA. With the emergence of VanRoekel, Ridley and Greater Mankato have acquired a nutrient and supplement that helps everything around him grow. As you and I were becoming acquainted before sitting down for this interview, you told me off the cuff that you had read in our last issue about how Deb Taylor had been adopted from South Korea—and how much that story meant to you. While living in Chicago in the early ‘90s, I was traveling internationally for Continental Grain Company. We had a consulting arrangement with a South Korean company. I recall going through the airport in Seoul and seeing Korean and American businessmen carrying babies. I asked some questions about why and learned these businesspeople flying had signed up to transport babies for an adoption agency. So on that trip from South Korea to Chicago I ended up caring for an 8-week-old South Korean baby. The baby was picked up in Chicago and adopted by a family from Des Moines. I did this a couple times and it was transformational for me. Not to get emotional, but I realized I was caring for a baby whose life would soon be completely changed and I began thinking about how I had been feeling sorry for myself. I made the decision right there in my mind, that when I traveled internationally, from that moment forward, how I was going to treat people. While traveling, I could choose to be miserable or to embrace it. All of a sudden, travel became different. There is nothing to be accomplished by being upset as a result of traveling other than to hurt yourself. So I now have this thing I like to do. If I’m at an airport bar, for example, I might sit down on a layover and buy the person next to me a drink on the condition they buy the person next to them one—or I might pick up their coffee. It’s amazing the kind of conversations you can start. I did that a year ago at the Minneapolis airport and struck up a conversation with Jordan Burnham, a man who speaks at high schools and colleges about when as a teenager he threw himself off a fifteen story building trying to kill himself. He survived. Now he is a prominent speaker on suicide prevention. I talked with him about my grandfather’s suicide—and missed my connecting flight because of the good conversation. I grew up in Maurice, Iowa, a town of about 50 back then. The telephone book had one page. It was a Dutch community. I ended up at Northwestern College (in Orange City, Iowa) in an odd way. In high school, I was considered a very average student. My guidance counselor and teachers said I had never worked up to my potential. When age 18, my senior year, I literally got off the back of a hayrack to go on a vocational school tour. My school counselor had convinced my parents vocational school was the right place for me. I was uncomfortable touring the school and on the drive home with my parents asked if there was something else I could do. My dad had attended Northwestern College and we would be going right past it on the way back to the farm. My dad said he would try to get me in, and the next thing I knew I was in a dorm room. It seems striking that someone so used to things being so small would end up running something very big. When you grow up on an Iowa farm in the ‘60s and ‘70s, the world is really small. Your life revolves around work with dad and going to school with a small group of kids. My grandfather was the junior high school science teacher. We went to church three times a week. When you grow up in agriculture in small-town Iowa in a fairly religious community, all those constants create a good foundation. I learned the value of family, hard work, and education. Where did you learn to take risks? Your company has taken many risks over the last decade since you’ve been leading. I’ve always had a philosophy that if you set your goals too grand and too far down the road then you miss things happening right in front of you. In terms of my life, that can be illustrated by my getting off the hayrack and ending up at college after having never initially intending to be there. If you work really hard at objectives today, think things through on your own so they make sense for you, and not get too far ahead of yourself, then opportunities to take the next step and beyond will come to you. We have that same philosophy at Ridley. We’re ambitious and take risks, but we don’t believe in setting big, audacious goals, like doubling the size of our company or putting a man on the moon. Those kinds of goals don’t resonate well with most people. We’re conservatively leveraged as a company and have little debt. We want to be in a position to take advantage of good acquisition opportunities. I spent most my time on the farm with my father. He had grown up on his dad’s farm, had left for school—was an accountant for a short period—and returned to the farm. He grew his farm many times over through the ‘80s. He taught me a work ethic. He was very smart and took risks during some difficult periods. Like many fathers and sons, he and I didn’t get along well on the farm. I used to think it was because we were both stubborn, but after having raised two boys myself into adulthood, I can say that it probably had more to do with me. My dad and I have a great relationship today. Can you think of any event in your corporate career where you felt you were too far ahead of yourself? We have made some significant mistakes. One was being heavily involved in financing large livestock and poultry operations in the late ‘90s to early ‘00s. Many of our competitors did the same: they wrote sub-debt financing to get a customer’s business. So, in essence, you were trying to become your own best customer. In a manner of speaking, yes. That turned out wrong. For one, we had tens of millions of dollars out in sub-debt and, when markets turned bad, had to write off a substantial portion. As a company, we took our eyes off the ball in doing what we do best, which is nutrition. We also became involved in swine genetics. My constant reminder of that venture is a porcelain pig sitting on a bookshelf here in my office. The business was Cotswold, which was an acquisition made before my time, with locations in the U.K., Germany, Canada, and U.S. This was a fairly misguided attempt at trying to become our own customer and to diversify. We eventually exited that industry after some $50 million or more in losses. I would imagine the temptation to become your own customer would be great at times. Would you do it again? There is something to be said for diversification, but it has to be well thought out. One thing our management team spends time on here is thinking about what we should not be doing. We’re just coming off our fifth consecutive year of solid growth. I attribute that to three things: one, we are fortunate to be in agriculture and when agriculture is going well that generally goes well for agribusiness; second, we have a great management and employee team focusing on the right things; and lastly, over the last six years we have left all the wrong things. One person in town I bounce ideas off is Denny Dotson. To me, it’s remarkable he has a thriving foundry. One reason is some time ago his management team decided to stop doing some things. For them it was manufacturing castings over a certain weight that they couldn’t do efficiently. We have done the same thing. We stopped doing high-volume, low-margin work. We are focused now on higher value-added, lower-inclusion, specialty products. When we say we’re a feed company or animal nutrition company, most people might think we manufacture finished feed. But in reality we make mostly the products that go into finished feed. If we were in the computer industry, we would be like Intel, which makes chips for computer manufacturers. For example, we have a facility in Illinois manufacturing very low inclusion, vitamin and trace, mineral premixes. Those concentrated mixes go into egg layer feed at the rate of one pound per ton or less. We stay focused on things like premixes and specialty products, not finished products. Take me through your career path after college and before being named Ridley president in 2004. I stayed at Northwestern College two years. When I left the farm, it was obvious I wasn’t going to go back. I transferred to Iowa State and majored in animal science. My parents helped pay for college, but I earned a good portion by working in a local bar and restaurant. I married my senior year and was very motivated to find work after graduating in 1983. I started off with Continental Grain’s Wayne feed division as a sales person in Iowa. I’m proud to have been in sales and learned things that would carry through my entire career. I learned that if you listen to a customer, and if you have something that can help him, and form a relationship, it was just a matter of getting him on the same page. That same philosophy carried through with every position I’ve had. My job today is to listen to everyone from customers to employees to shareholders and the board, and try to understand what they are saying and wanting. If I can do something to meet their needs, everybody wins. I spent three years in sales, had some success, and moved into a marketing manager position with Wayne in Chicago about 1986. I was there seven years in a variety of positions from business development to responsibility at one point for the company research farm and marketing department. I became bored after seven years, and then an opportunity became available to start up a new business unit for them on the West Coast. I raised my hand to do it. While in California five years, I helped start dairy feed joint ventures in Fresno and Phoenix. I also had the idea of starting a large egg operation in Utah. We had a client who was one of the nation’s premier egg marketers—and another client in Iowa that was building some modern egg production operations—and my idea was to put them all together with Continental Grain and into one facility in Utah. You had never done anything like that before. It was a $45 million project. I was in my 30s. There were a lot of people who said we couldn’t do the deal. I brought the partners together, we got a team together to help and raised the financing we needed, we bought property, and at the last minute my company dropped out. There was a line of others wanting in. The facility was constructed, and today still is operating in Utah. What did you take away from that experience that laid the foundation for other projects you would have with Ridley? That’s a very good question. Number one, I did my homework. I understood the costs of moving around raw materials and had good estimates to the penny. I knew how far away we had to be from retail markets in the West in order to take orders at night and deliver store door next day. The (Utah) partners were classic entrepreneurs. For example, we planned a two-day trip to Utah to look for potential sites. We picked one town because of its location on rail and proximity to truck freight. We planned for two days of analysis, including site planning and having the county people with us. I put both these entrepreneurs in a car. On the way into town, at the same exact time, they both simultaneously asked me to stop. I pulled over. They both got out and walked about 30 feet in front of the car. I said, “What are you looking at?” I thought we had many things to consider before picking a site. They said, “We think it will look good right here.” (Laughter.) I learned from them that if something made sense, go for it. And after awhile you joined Ridley? I ended up back in Chicago. I never thought I’d leave Continental Grain. I had been there 16 years. When I started there, Continental and Cargill were the same size. But by the ‘90s, Continental was making dramatic changes, including selling their core grain division to Cargill. I was on a team at Wayne looking at the future of our division and didn’t like the conclusion. I felt I had a better idea. Ridley was growing, and had been in North America only five years. In 1999, CEO Bob Gallaway at Ridley was looking for someone to run Hubbard and contacted me. Bob Gallaway hired you. This was only five years before you took over. Were you hired with the intent of taking over some day? I don’t know, you’d have to ask Bob, but it wasn’t my intent. But when coming to Mankato, I did have responsibility for Hubbard. About six months after being in Mankato, at a Ridley board meeting, we proposed that Ridley buy the Wayne feed division of Continental Grain, the company I had left. Bob Seldon, another great entrepreneur who was on the board, said it would be a great opportunity. In 2000, we closed on the acquisition. Suddenly, I was back with the same fantastic people I had been with before. Bob Gallaway personally moved Ridley headquarters to Mankato. He was on our cover ten years ago. What are your impressions of Bob? I’ve learned much from him. He and his wife are doing well and I just saw them this weekend in the grocery store. I learned from him how to be fiscally disciplined in terms of running the company. I also learned patience from Bob. Was the transition to CEO difficult? The minute you become CEO, the good thing is you have a pulpit from which to get things done, but the bad thing is if you use that pulpit too much, you can get yourself in trouble. Also, the minute you become CEO, people begin taking you a little too seriously. I remember the first time a particular executive and I talked after I became CEO. We were just (having a brainstorming) session. I noticed he was writing things down. I said, “What are you doing?” He said, “Well, we’re going to do this, aren’t we?” I have people who work for me who are brilliant operational guys, who get things done, have great business savvy, and are shrewd judges of talent. You have to be very careful what you do and say because they already know what they’re doing. Give our readers some idea about the size of Ridley. From a revenue standpoint, we’re about $600 million. We don’t spend time dwelling on revenue numbers because we’re commodity-based. Commodities prices can go up and down. Last year we had an EBITDA of $40 million and a net profit of $21 million. We have 29 U.S. plants and 700 employees. Many of the employees in this office are advanced degree professionals. We have about 50-some employees overall with advanced degrees in some form of animal science. We have about the same size business in Canada, Masterfeeds LP—it’s arguably Canada’s largest feed business. It’s a joint venture with AGP. Their sales are not included in the $600 million figure. That business alone is the same size as ours. We are the only two owners, it’s headquartered in Ontario, and it operates completely separately. Ridley has an office in Winnipeg. Do you pay corporate income taxes in the U.S. or Canada? You’re listed on the Toronto stock exchange. There is a corporate office in Winnipeg, but no one is there. It’s only there because we are incorporated in Manitoba. The office was moved here because Bob was named CEO and he had been living here. All company functions are done here. Virtually all our income, except that which comes out of our Canadian joint venture, is U.S. income and is taxed at U.S. tax rates. The fact we are traded on the Toronto stock exchange is unusual, but it was the most expedient way in the 1990s for us to raise capital to buy Hubbard Milling. That’s why Ridley went public. We began in Canada. Ridley Corporation of Australia held 60 percent of the shares until 2008. If your readers are wondering if we have been taking advantage of a tax avoidance, the answer is, no. Unfortunately, we don’t avoid much in terms of taxes. (Laughter.) But that’s a good question, and I’ve been surprised people haven’t asked before. In 2008, Ridley paid out $6 million to Canadian cattle producers to settle a lawsuit over what is commonly called Mad Cow disease. What did you learn from that experience? I learned how to spend a lot of time in lawyers’ offices. (Laughter.) There is only so much I can say about this because, believe it or not, this class action lawsuit is ongoing. We settled for a tiny fraction of what the face value of this suit was, which should tell you something about the validity of the lawsuit. It was a class action lawsuit brought on behalf of Canadian cattle farmers. Ridley and the Canadian government were named as the two parties. The lawsuit against the Canadian government continues. Our settlement amount, basically, went to fund the law firm suing the Canadian government. We are still a party to it. But any liability on our part has been settled. Their allegation was we provided the feed that fed the farmer that resulted in Mad Cow disease. We disputed it. Your company has been especially aggressive with acquisitions, adding about a half dozen companies since 2000. Walk me through the joint venture with Masterfeeds, which you touched on earlier, and what that move did for your company. We had struggled for years in Canada, even though our initial entree into North America was made through it. In about 2009, I called Rob Flack, who runs the Masterfeeds business, and said we should talk. We met two or three times, and nothing happened until three years ago, when we were competing to acquire a Canadian company and both of us missed out. In 2012, we put our businesses together. We have had a great partnership with AGP (which owned Masterfeeds), our partner. To close the deal, we all met with our chair and AGP’s leadership team. We all sat for dinner about seven o’clock, and had an hour or two of conversation about the way we all looked at the world. Then someone at the table said, “Why not get this done tonight?” Our majority shareholder is Fairfax Financial Holdings of Toronto. AGP is the majority shareholder of our joint venture, and a co-op. You’re having a new headquarters building constructed in a high profile area of Mankato. When did you make the decision to occupy that building? We will occupy about three of the five floors. It’s a funny story. I ran into Kim and Kent Schwickert in the Chicago airport in January 2014 and we chatted. Back in Mankato, Kim called to ask if we had any interest in moving. I told him no. A day later, and without knowledge of my conversation with Kim, my CFO called to tell me our lease was up at the end of the year and we needed to do our due diligence. He called Kim to get an idea about costs. The next thing we knew Kyle Smith and Michael Sather (of Tailwind Group) were in our office and they said they were going to put us in the building. In short, our out-of-pocket costs will actually be lower. Between Kyle and Michael, the other investors, and the City, this was a win-win situation we couldn’t pass up. You’re the past chair of the American Feed Industry Association. Tell me about some experiences you had on Capitol Hill. Anyone that has been to Capitol Hill can’t help but be inspired. Everyone usually goes in the spring to Hill visits. There are all these bright, young, intelligent people there and all this great history. But then, it’s sort of like Las Vegas—after a day and a half you can’t wait to get out. Everybody complains about gridlock. You can feel that tangibly when you’re there. I’m neither a Democrat nor a Republican—and I won’t disclose my political persuasions. When in Washington, you learn your representatives aren’t calling the shots. It’s the parties. Can meat, milk, and egg production—the industries your company is based upon—co-exist with ethanol production? In the near future, at least, there probably won’t be more ethanol plants built. Based on this year’s corn crop—and I’m not pro- or con-ethanol—we’ve proven we can produce enough to satisfy existing production of ethanol and also demand for meat, milk, and egg production. Having said that, by 2050, there will be another three billion people who will require more food. In the long term, can we co-exist? We’ll see. There is an old adage: Never bet against the American farmer’s ability to produce. This year was another clear evidence of that. You’ve been involved as past chair of Greater Mankato United Way, and with Feeding Our Communities Partners and Mankato Family YMCA. What are your impressions of having served with those organizations? I’d always been involved with organizations as a fundraising volunteer, but hadn’t been actively involved with (nonprofit) board responsibilities until I became CEO. What I’ve gotten out of that is the chance to meet many terrific people who I have learned a great deal from, both business and nonprofit. We have some really talented business people in the community, such as Laura Bowman and Denny Dotson. Laura was president with United Way when I was chair. I learned from her. If in the private sector, she could easily run a company. As for Denny Dotson, I have learned about many things, from lean manufacturing to how to manage through cyclical down times. If I’m having a question about something I’m not sure I’m looking at the right way, I have coffee with him. I’ve always read Connect Business Magazine and found the magazine fascinating. The cover stories (usually) are about people putting their own money at risk. That’s not the case with me. I’m fortunate to be surrounded by a great management team and employees, and to be working in agriculture. What we have accomplished at Ridley—and that’s been quite a lot these last five years—has been the product of a team effort. I want to make sure this comes across to your readers. Organizational involvement: Feeding Our Communities Partners, board; YMCA board; Greater Mankato United Way, former chair; and American Feed Industry Association, former chair. Fairfax Financial Holdings (majority owner of Ridley) has been one of Canada’s largest insurance companies and owns roughly 70 percent of Ridley stock. It manages about $30 billion in investments. In 2009, after talking with potential investors, Steve VanRoekel received a telephone call from Fairfax’s founder, Prem Watsa, saying he was interested in buying the majority interest. He wanted VanRoekel in Toronto right away. So VanRoekel and his CFO went, and they all talked for four hours, after which Watsa announced his intent to purchase the majority of shares. India-born, Watsa donates a certain percentage of pre-tax company earnings to charity. His policy inspired Ridley’s policy of donating one percent of earnings to charity, amounting to more than $1 million in recent years, said VanRoekel.